Although the STEREO mission is focused on the Sun, solar wind, and solar activity, STEREO data is used to study other astronomical objects as well. 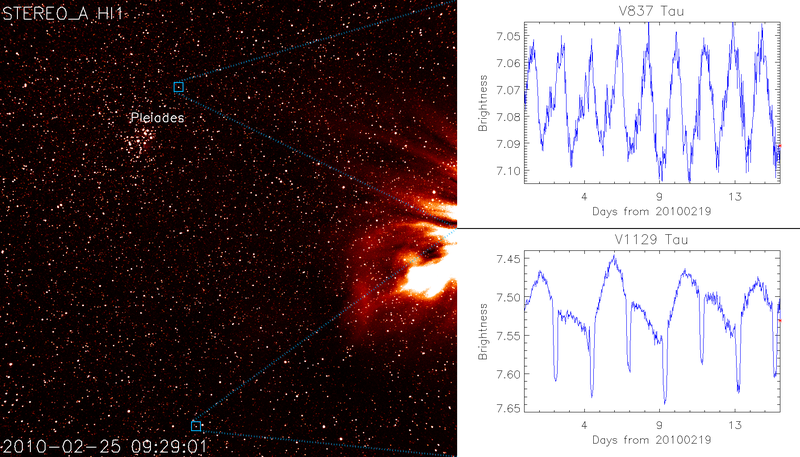 The Heliospheric Imagers (HI), part of STEREO's SECCHI imaging suite are highly stable, and, because they observe a large area of the sky, can sample light from a star for up to 20 days. This makes them highly useful for studying variable stars. Researchers have discovered 122 new eclipsing binary stars and observed hundreds more variable stars in an innovative survey using NASA's two STEREO solar satellites. The survey has been carried out by team from the Open University, University of Central Lancashire and the STFC Rutherford Appleton Laboratory. Dr. Danielle Bewsher presented highlights at the RAS National Astronomy Meeting in Llandudno, Wales on Tuesday 19th April. A STEREO/HI-1A image taken on 7th March 2010 (left) with two variable stars highlighted in the image. The varying brightness of the two stars, V837 Tau and V1129 Tau are shown (right top and bottom, respectively). Movie also shows data from the stars HR 1406 and SZ Tau. Image: Image produced by D. Bewsher (UCLan). Data courtesy of NASA/STEREO and the HI instrument team. Movie credit: Danielle Bewsher (UCLan). Data courtesy of STEREO HI team and K. Wraight (OU).